Since tech stocks returned from their brief purgatory of underperformance to return to the top of the market heap, the industry propelling the sector forward more than any other has been communications equipment—those companies that specialize in the under-the-hood tech that makes today’s digital universe go. True, many of these companies aren’t exactly household names, but as of yesterday the group was up around 22% on the year, leading the S&P 500 (SPX) tech sector by 3% and the SPX itself by nearly 10%. That should at least grab the attention of some traders who weren’t already aware of the action in this corner of the market. CSCO is up around 23% on the year and 32% from its December low. The company has been around since the go-go days of the original 1990s tech boom, which went bust in 2000 and dropped CSCO shares from above $80 to around $8 in 2002. Although the size of the recent rally may lead some longs to think “hmmm, maybe I should take some profits,” that doesn’t necessarily mean the rally is kaput. 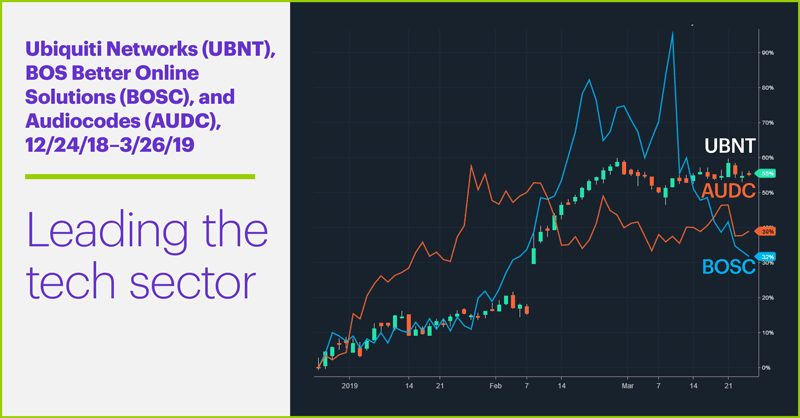 One recent study cited the economic expansion occurring in the communications equipment industry, and specifically the absence of short-selling interest in CSCO shares3—in other words, it didn’t look like short sellers were targeting the stock. That’s not to say that deeper pullbacks than the ones that have appeared in CSCO so far this year won’t happen—they will, at some point—but if tech continues to lead the market, and communications equipment continues to lead tech, bullish traders may continue to view dips in CSCO and its compatriots as opportunities rather than setbacks. Market Mover Update: May WTI crude oil futures (CLK9) reversed their recent pullback amid signals from Russia that it would follow through on its pledges to cut crude production.4 The market rallied more than 1.5% and pushed above $60/barrel intraday. Today’s numbers (all times ET): International Trade (8:30 a.m.), Petroleum Status Report 10:30 a.m.). Today’s earnings include: At Home Group (HOME), Lennar (LEN), Paychex (PAYX), Five Below (FIVE), Lululemon athletica (LULU), PVH (PVH), RH (RH). 1 TheStreet.com. Cisco's Valuation Doesn't Reflect the Advantages That Come From Its Scale. 2/19/19. 2 Silicon Valley Business Journal. Cisco launches early-stage investment firm headed by former NEA partner Jon Sakoda. 3/26/19. 3 HIS Markit. 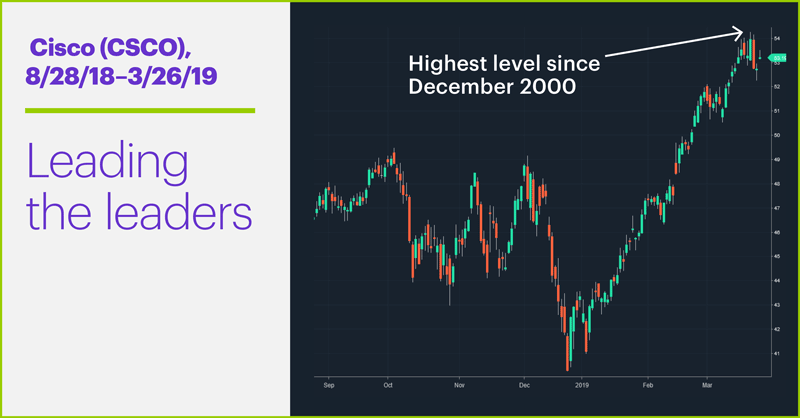 See what the IHS Markit Score report has to say about Cisco Systems Inc. 3/26/19. 4 Bloomberg.com. Oil Rebounds as Russia Signals Its Commitment to Output Cuts. 3/26/19. High put-call ratio and intraday rally present interesting scenario for short-term traders.